Ali Tabatabaee, left, with Matty Lewis. Ali Tabatabaee (born February 27, 1973) is one of two main vocalists in the band Zebrahead. He is originally from Tehran, Iran but attended high school in La Habra, California where he met the other members of Zebrahead. 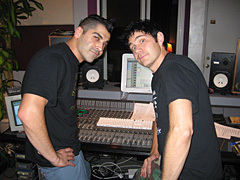 Due to Zebrahead's growing popularity in Japan, Ali Tabatabaee and Zebrahead bandmate Matty Lewis were asked by SEGA to record vocals for the theme song "His World", which appears in the 2006 PlayStation 3 and Xbox 360 video game Sonic the Hedgehog. This page was last edited on 25 March 2012, at 09:13.